tax freedom day | Inertia Wins! -Disclosure. Each year’s federal budget, or the annual “Economic Report of the President,” should include in-depth chapters exploring the regulatory state, along the lines of Ten Thousand Commandments. The more the public and policymakers know about regulatory costs, the more likely they are to do something about them. -Eliminate obsolete rules. Congress should task the Office of Management and Budget with identifying rules to eliminate each year. Congress should also implement its own bipartisan packages of cuts to be voted on, up or down, without amendment. Mandatory 5-year sunsets for all new rules would also help. Congress can reauthorize useful rules, while obsolete or harmful ones would automatically expire. -Most important of all, Congress needs to reassume its lawmaking responsibilities. It passed 125 bills last year—but federal agencies passed 3,503 final rules. This “regulation without representation” should end. There is too little accountability when it comes to regulation. Today, April 9, is Tax Freedom Day. The good folks at the Tax Foundation calculated how much money local, state, and federal governments harvested last year from taxpayers ($3,469,000,000,000), and compared that to national income ($12,901,000,000,000). At 26.89 percent of national income, you basically work until April 9 just to pay off your taxes. April 9 is the national average; different states have different tax burdens, so Tax Freedom Day actually varies from state to state. If you live in Alaska, you already celebrated Tax Freedom Day on March 26. But if you live in Connecticut, you have to keep the champagne on ice until April 27. That isn’t the whole picture, though. The federal government spends far more than it taxes. $1,414,000,000,000 more, last year alone. The burden of federal deficit spending adds another 40 days. Not even counting state and local deficit spending, that puts us out to May 19 by my calculations (May 17 by the Tax Foundation’s). Even that’s not all. The hidden tax of federal regulation cost businesses and consumers an additional $1,187,000,000,000 last year, according to Wayne Crews’ soon-to-be-released 2010 edition of Ten Thousand Commandments (previous editions are online here). None of that extra trillion-plus actually shows up in the federal budget. Regulation eats up an additional 9.2 percent of national income, or 8.3 percent of GDP. So you have to work an additional 34 days until you pay off the federal regulatory burden. 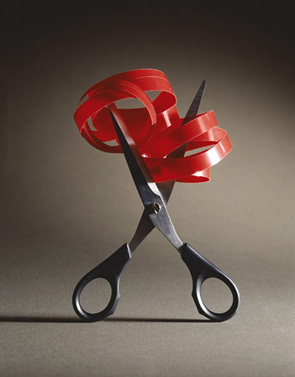 It’s tempting to brush off regulatory costs, since most of them are borne by businesses. But remember, businesses pass on their costs to consumers. You pay for the regulatory state. Its costs are real. Adding together total taxes, plus federal deficit spending, plus federal regulations pushes us out to June 22 by calculations, or June 20 by the Tax Foundation’s. And remember, that’s leaving out state and local deficit spending. Nor does it count state and local regulations. I don’t have the data handy for that. But if they add up to at least $460,000,000,000 then we’re past the half-way mark of the year. Just to pay for government. Even using the larger number of GDP ($14,253,000,000,000 in 2009), and leaving state and local deficit spending and regulation, we’re still talking 42.9 percent of the economy going to pay for government. That’s 157 days out of the year. You’re not free until June 6 even by that generous measure. I’d argue that government has grown too big, but the data have already done that for me.